The University Athletic Association says it's removing all references of Aaron Hernandez in and around UF's football stadium. The University Athletic Association says it's removing all references of Aaron Hernandez in and around the football stadium at the University of Florida in Gainesville. A statement released Thursday morning says the organization "didn't feel it was appropriate to celebrate" the former Gator and New England Patriots tight end. The 23-year-old is charged with murder in the killing of Boston semi-pro football player Odin Lloyd. 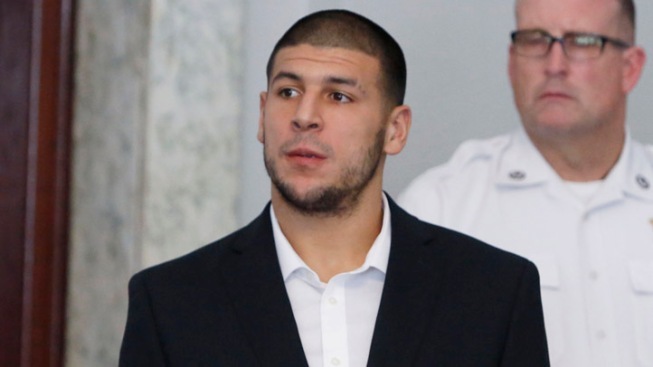 Hernandez has pleaded not guilty. The statement says that immediately following the news, a plan was put in place "to remove his likeness and name in various private and public areas." Those areas include the end zone team area, locker room, lobby and brick display outside Ben Hill Griffin Stadium. The UAA says the plan is to have everything removed before the end of July. Ernest Wallace, who police say is connected to the killing of Odin Lloyd, waived his right to an extradition hearing in South Florida Monday afternoon. Wallace, 41, signed the waiver in a court appearance before Broward Circuit Judge John Hurley.